At Least 12 Killed In Mumbai Building Collapse : The Two-Way The building was declared dilapidated, but people were still living there. The Indian city has experienced recent flooding, and substandard building materials have been a factor in other collapses. Rescue workers look for survivors in the debris of a collapsed building in Mumbai, India, on Thursday. Rescuers were still helping find and pull people from what The Associated Press described as a "huge mound of mud, concrete slabs and twisted steel girders" Thursday afternoon. The building was located in the Bhendi Bazaar area in the south of the Indian coastal city. More than a dozen people had been rescued and sent to a hospital Thursday afternoon, and several more may still be trapped in the rubble. Manoj Sharma, a police official, told the AP that nine families lived in the building. A nearby resident described the scene to Reuters. "There was a massive bang. We couldn't see anything due to the dust and smoke. Once the dust settled, we realised it was a building collapse," Amina Sheikh told the wire service. Mumbai's municipal housing authority declared the building dilapidated in 2011, Reuters reports. According to the BBC, this is the third time a building has collapsed in Mumbai in less than a month. 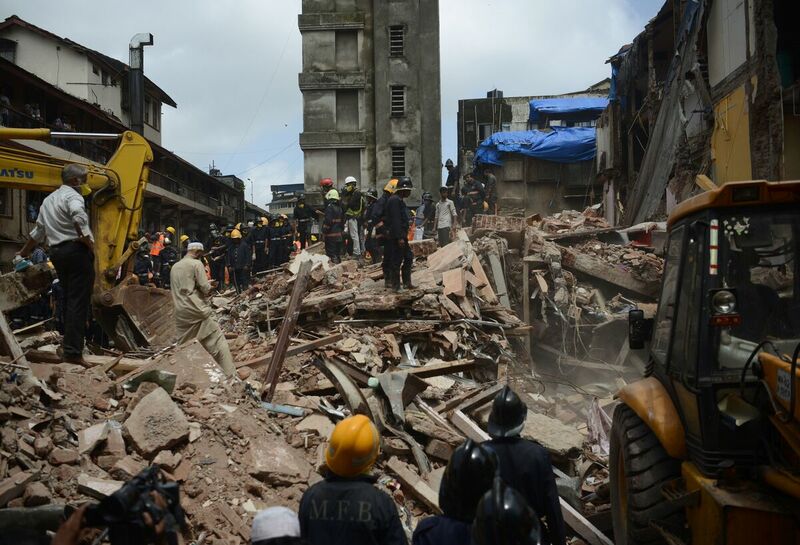 Seventeen people died in July when a building collapsed in Ghatkopar, a Mumbai suburb. Structural collapses — not just of buildings — are more common in India than in the West. A wall collapsed during a wedding in May in northern India, leaving 24 people dead. Last year, an overpass fell in Kolkata, killing 26 people. More than 70 people were killed when a seven-story building went down in Thane in 2013. Sixty-six people died in a four-story New Delhi building that fell in 2010. "Building collapses are common in India during the monsoon season, which is June to September. High demand and lax regulations encourage some builders to use substandard materials or add unauthorized extra floors." About 1,200 people have died in the recent floods in India, Nepal and Bangladesh. "Many parts of Mumbai sit just feet above sea level. And this is one of the world's most populous cities — 20 million people. And it's a mecca for people migrating to the city for jobs. And that is driving construction. It's popping up on flood plains and coastal areas unchecked. And all that is also generating tons of garbage. And what have they discovered? That the waste is clogging the stormwater drains which makes Mumbai even more vulnerable to flooding."